If there is a place where you can find serenity and inner peace in the busy shopping district of Myeongdong, it is none other than Myeongdong Cathedral. It is not only an iconic historical building in Myeongdong, but also a Catholic Church with rich heritage and contributed immensely to Roman Catholicism and also democratic movement in Korea history. Apart from coming to Myeongdong to shop and eat, many tourists, foreigners and local Koreans come to Myeongdong purposely because they want to visit Myeongdong Cathedral. Here we present a map with simple walking direction to guide visit to go Myeongdong Cathedral from Myeongdong Station (Subway Station / Bus Station). One of the most convenient way to go to Myeongdong Cathedral is by taking the Seoul Metropolitan Subway. 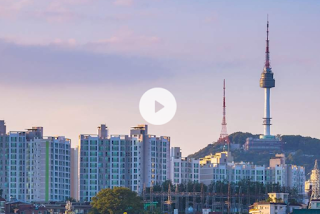 Regardless of where you start your journey, be it Gangnam, Insadong, Itaewon, Hangdae or any other districts in Seoul, you should take the subway train towards Myeongdong Station on LINE 4 of Seoul Metropolitan Subway. Upon arrival at Myeongdong Station, get to the ground by using EXIT 8 of Myeongdong Station. On the other hand, if you are taking bus, get off or alight the bus at Myeongdong Station. From Myeongdong Station, you can follow the map above to talk to Myeongdong Cathedral. The checkpoints on the walking direction map CHECKPOINT A, CHECKPOINT B, CHECKPOINT C, CHECKPOINT D are shown in the photos below. 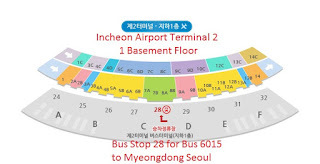 [CHECKPOINT A] From Myeongdong Station EXIT 8 or Myeongdong Station for Airport Limousine Bus, turn into the street towards Nine Tree Hotel following the read arrow [CLICK PHOTO TO ENLARGE]. The first checkpoint is CHECKPOINT A where you should make a turn into the street where Nine Tree Hotel is located. 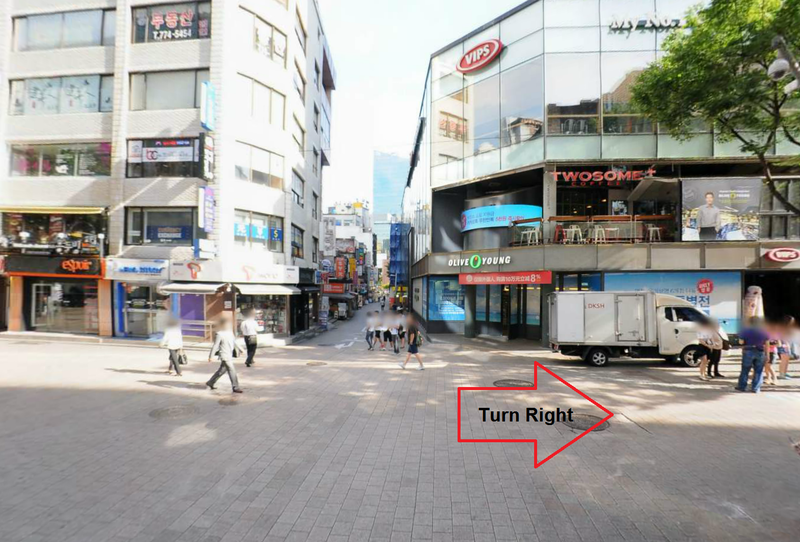 For those who arrive from EXIT 8 of Myeongdong Station, you should turn left into this street. For those who arrive from the Myeongdong Station bus stop for Airport Limousine Bus 6015 / 6001, you should turn right into this street following the red arrow on the photo for CHECKPOINT A. Note that travellers staying at Sejong Hotel, Skypark Myeongdong 3 Hotel and Lotte L7 Myeongdong hotel can also follow this direction. After turning into the street where Nine Tree hotel is located, you will come to CHECKPOINT B, which is a T-junction. At this point, just walk straight across the T-junction towards MCM flagship store direction, as shown in the photo below for CHECKPOINT B. 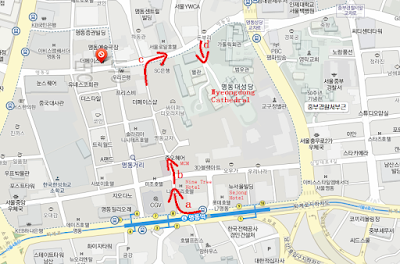 [CHECKPOINT B] Walking straight across the T-junction towards MCM direction to go to Myeongdong Cathedral. Beyond CHECKPOINT B, you should continue to walk in the straight direction for about 150 meters until you come to CHECKPOINT C, which is a big T-junction as shown in the photo below. Along the way, you will find many attractive shops and and restaurants. It is quite easy to get distracted. So, remember that you are on your way to Myeongdong Cathedral. 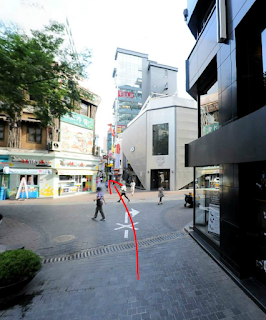 [CHECKPOINT C] At this big junction, turn to your right towards Myeongdong Cathedral. When you reach CHECKPOINT C, you are actually very near to Myeongdong Cathedral. Take the right turn at this junction. and continue walking for about 80 meters. Along the way, you will see convenient store like 7 Eleven and cafe like Starbucks Coffee. 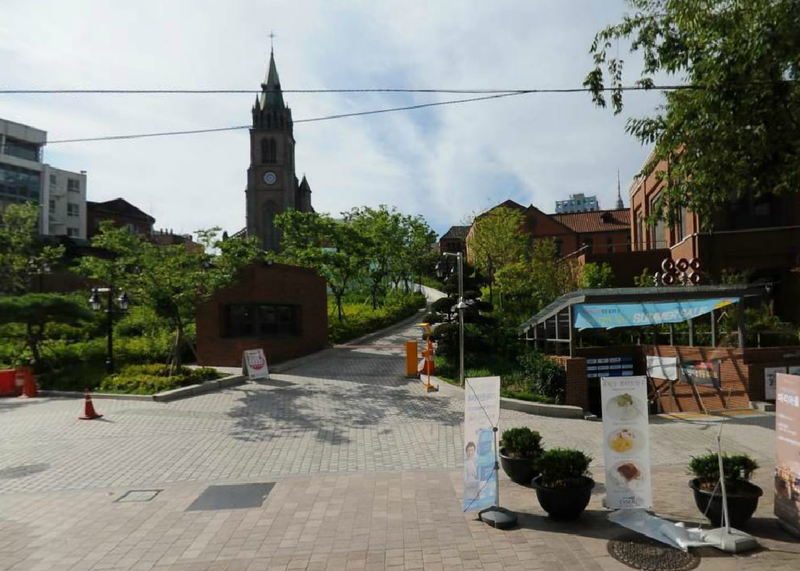 After about some 80 meters of walking from the T-junction at CHECKPOINT C, you will arrive at the CHECKPOINT D, the entrance to Myeongdong Cathedral, which is on your right hand side. Finally, you can see the Myeongdong Cathedral in front of you. Just turn right into the small road leading you towards the cathedral which is located on a small hill. That is it. You have arrived at Myeongdong Cathedral from Myeongdong Station, the total walking distance is less than 400 meters, with lots of things to see along the way. You can always visit the shops and restaurants along your way back after visiting Myeongdong Cathedral. 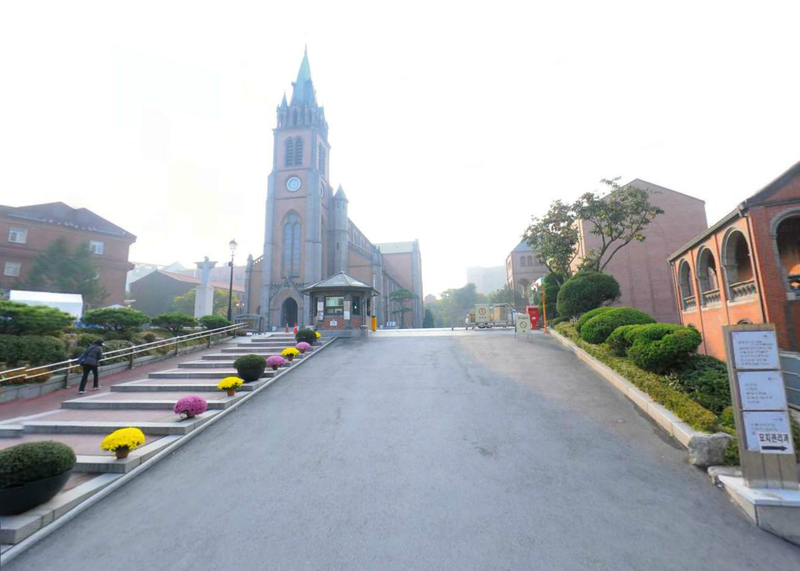 Myeongdong Cathedral is one of few Catholic Church in Seoul that has English service. The schedule for English Sunday Mass at Myeongdong Cathedral is on every Sunday, 9:00am at the cathedral. In addition to that, there is also English Confession before the 9:00 am mass on every Sunday. With the first weekday mass (Korean) starts at 6:30am and last mass at 7:00pm (except Monday evening), Myeondong Cathedral is open for visitors throughout the day. So feel free to walk over for a visit if you are in Myeongdong. That is it. 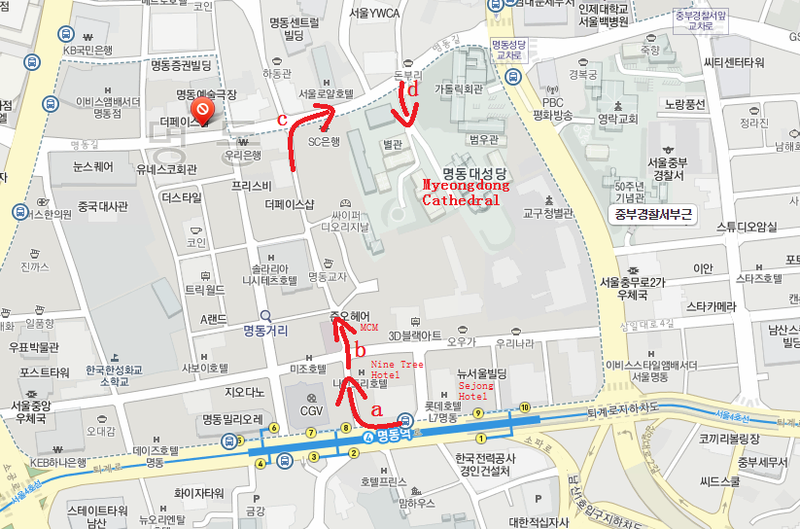 The map and walking direction to go to Myeongdong Cathedral and the schedule of English Sunday Mass at the Cathedral. Of course if you are driving, you would need to follow the GPS direction to get here. The GPS is 37.5631812, 126.9851717. It is also possible to get to Myeongdong Cathedral by using Eujiro 3-ga Subway Station on LINE 2 and LINE 3 (if you are coming from Insadong) of Seoul Metropolitan Subway but the walking distance will be slightly longer. Otherwise, just follow the map and direction from Myeongdong Station as described in this post. In anyway, your visit to Myeongdong Cathedral will be definitely worth it! Please give directions to Myeongdong Cathedral. We are booked at Lotte L7 Hotel and would like to attend the English mass at 9:00am on Sunday, July 10. You can walk towards Myeongdong Station from TMark Grand Hotel (about 500 meters) and follow the direction in this post to go to Myeongdong Cathedral. You can also tour the Myeongdong shopping district along the way. Normally Sunday Masses at Myeongdong Cathedral go on 7:00, 9:00, 10:00, 11:00, 12:00, 16:00, 17:00, 18:00, 19:00 (Youth Mass) and 21:00. If you want to attend the English Mass, it is at 9:00. 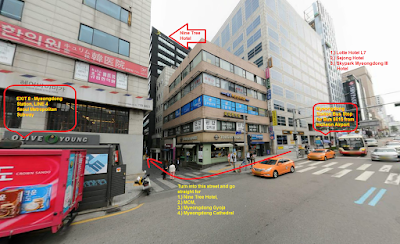 Girl generation hostel is about 1km of walk to Myeongdong Cathedral. Hi there! Would the English mass still be celebrated at the same time of 9am on Christmas Day, Sunday 25th Dec 2016? Thanks for clarifying! Hi! I will be staying at Starria Hostel in Myeongdong, can you tell ne how to go to Myeongdong Cathedral from my hostel? Thanks! Just go to Myeongdong Station (subway station) and follow our direction from EXIT 8 of Myeongdong Station. If you plan to take subway train during your stay, you will go to Myeongdong Station very frequently. Enjoy your visit. Hi! How long would it take from the station to the cathedral? And is there an easy way to go the Myeongdong Shopping Centre? You can take bus 6015 from Incheon Airport to Myeongdong and get off the bus at "TMark Hotel Myeongdong" bus stop. From there, you need to walk for about 150 meters to get to Vestin Hostel. You may use google map to help you with the direction of walk. We are staying at nungmaru guesthouse. Can you give us direction in going there? 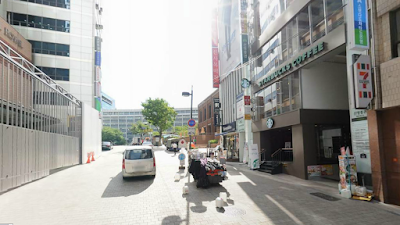 From Nungmaru guesthouse, you just have to walk down the hill to EXIT 2 of Myeongdong Station, then cross the main road to get to EXIT 8 of Myeongdong Station. 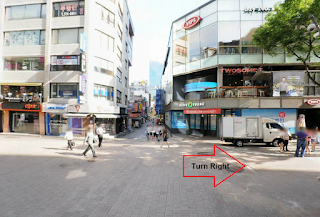 From there, follow the direction given in this post to get to Myeongdong Cathedral. If you are here on Easter, enjoy Easter in Myeongdong Cathedral.